Input selection is accessed via remote control or by a series of short presses on the volume/control knob. There are four input options, iPod, RCA 1, RCA 2, and 3.5mm stereo jack and they cycle in this sequence. 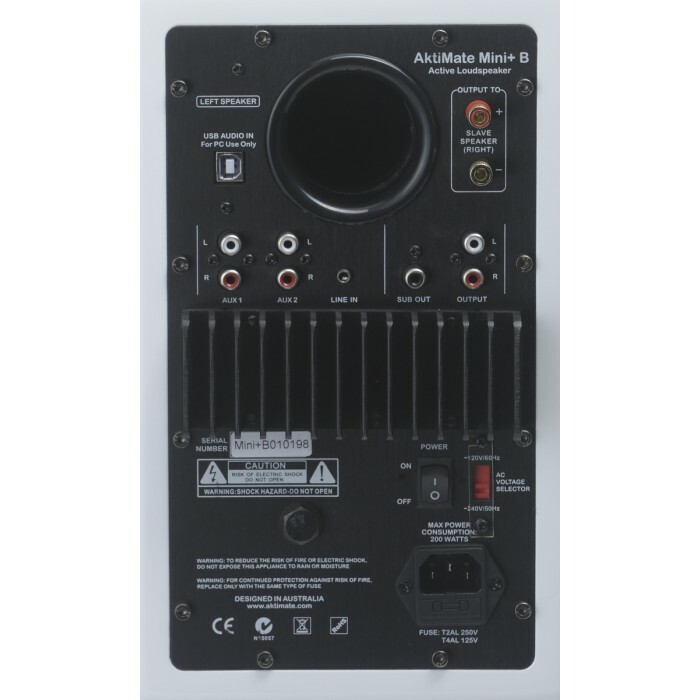 AktiMate Mini+ speakers have 2 other types of inputs on the rear panel. The 2 x RCA inputs (L&R) are ideal for connecting a CD player, tuner, or other line level source. The AUX 3.5mm socket is ideal for connecting to a computer sound card, AirPort Express, or other type of MP3 player. Your AktiMate Mini+ is an ideal TV speaker. Connection is simple using one of the RCA inputs. Alternatively it is possible to use the 3.5mm into a headphone out on your TV. Input selection is either by remote control or by use of the control knob on the front of the speaker. The selection operates on a cycle - iPod/Aux 1 (RCA)/Aux 2 (RCA)/3.5 mm jack. The Mini+ comes complete with speaker wire, so you can literally unpack, connect the speakers, connect to mains power, switch on, connect with Bluetooth® from your storage device and you can be listening to your favourite music through superb hi-fi stereo speakers within minutes of walking through your front door. AktiMate™ Mini+ speakers are available in a choice of gloss finishes - red, white or black.